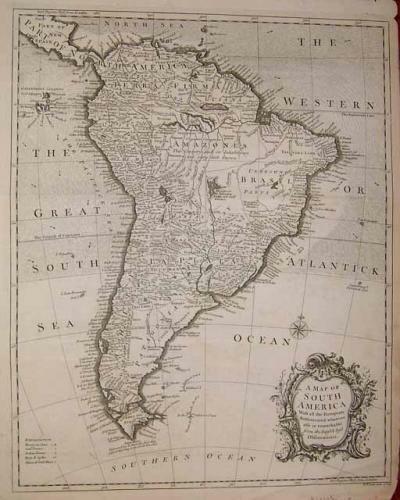 Title: 'A Map of SOUTH AMERICA. With all the European Settlements & whatever else is remarkagle from the latest & best observations'. A copper plate engraved map from Tindal's Continuation of Rapin's History of England. This is a page from the monumental history of Britain from the Roman period to George I. It was written originally in French by Paul de Rapin-Thoyras (1661-1725) and translated into English with additional notes by Nicholas Tindal (1687-1774). The work was published over a long period (1733-1747) with a second edition 1749-1751. London: J. Knapton. This engraving is signed by R. W. Seale (R.W. Seale del. et sculp.) and is rich in details while indicating what regions are less well known. Handsome cartouche in lower right corner. There is a portion of Central America in the upper left corner and the Gallapagos Islands are shown below. Age toning, darker on edges. Lower right and bottom edges fragile. Archival tape repair on edge on reverse. Two horizontal folds as published.